Download the ultimate guide to hands-on math and literacy learning here! 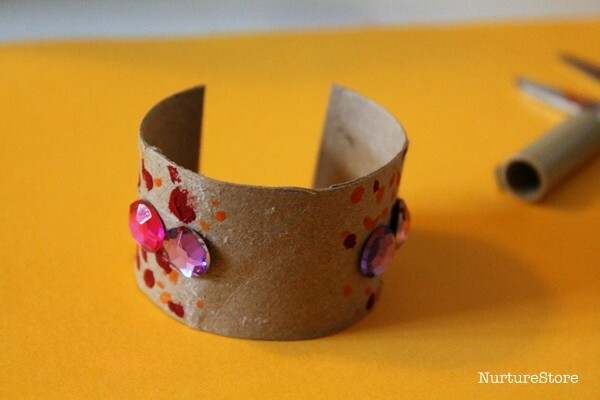 We started by cutting our paper roll down to the right size to make a cuff for our wrist. This will allow your child to wear their super stylish watch, and also take it off easily. Decorate your cuff any way you like. You could use paint, pens, stickers – whatever design you like. Then you need to make the face of your clock. We cut out a circle from some colourful card and used pen to write on our numbers. We’re doing lots of practise of telling the time at the moment, and this step gives you the opportunity to talk about the numbers on the clock. :: talk about how the numbers go from 1 to 12, but there are 24 hours in the day. So for each day we work our way around the clock twice. I made a clock face with the numbers written on for my daughter to copy. She’s still working on getting the numbers the right way round when she writes them, so I wanted to help her get them down correctly on her watch. We’re going to be using our DIY watch for lots of telling the time practise, so I wanted to make sure we’re reinforcing the correct formation of the numbers every time we look at them on the watch. Then make two hands for your clock. We cut ours out from two different colours of card, to help us remember one is for hours and one is for minutes. :: look at your real clocks again and identify which hand is for hours, which for minutes. :: are they the same size? :: are they moving at the same speed? Then use a split pin to fasten you watch together. Push the split pin through the clock hands, through the clock face, and through the cuff. Fold back the ends of the split pin, so they sit neatly against the inner side of the cuff. 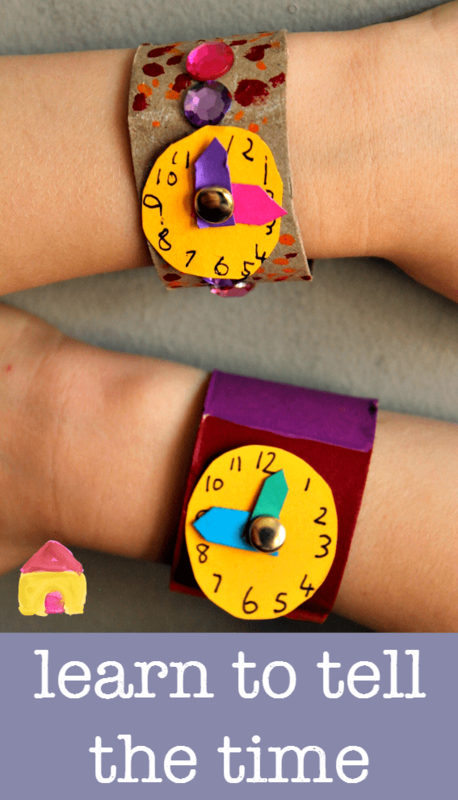 Use some sticky tape or washi tape to hold them in place and so they don’t poke your child when they wear their watch. 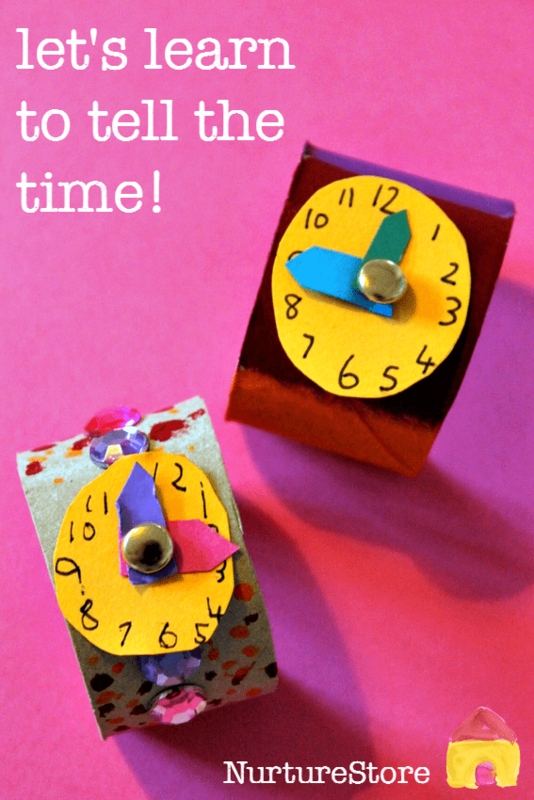 Then use your super stylish homemade watch to practise telling the time. Learning to tell the time using a clock is complicated. 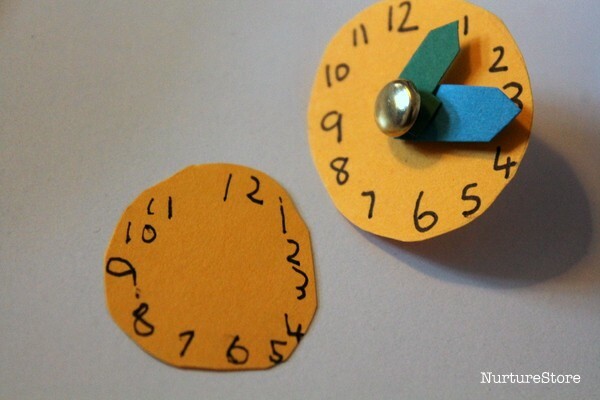 You need to understand day and night, the daily cycle of activities, recognising numbers, fractions, the five times table, am and pm, and that the clock is based on the numbers to 12 whereas most counting your child will be used to is using a base of 10. 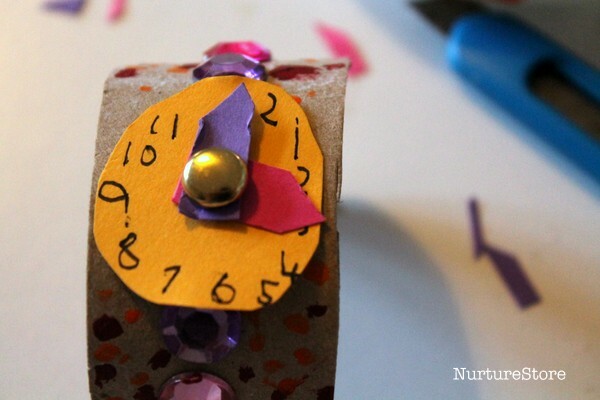 There is a lot of complex information to pull together to tell the time, which you can build on over a long period so that the learning is fun, flows along from one concept to the next, and makes real sense to your child. :: take things at the right pace for your child. They might like to begin simply by having fun wearing their watch and pretending to tell the time. 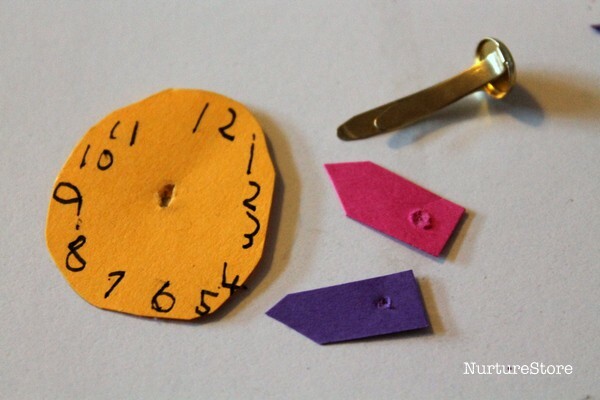 This is valuable as it helps them understand the first principles of matching a clock to different times of day, or when it might be important to know the precise time. Play is important. :: notice together how the sky outside changes through the day and night. :: make a circle chart with pictures of the activities you do at different times of the day. Help your child see the pattern and flow of a day, and then later match them to specific times. :: then begin to learn about the o’clocks, then the half pasts, then the quarter pasts and quarter tos, then the five past, ten past times, and so on. Remember that this is a complicated system. Take your time, add in fun, and enjoy using your super stylish watch. Do you have a young child who is learning their ABCs and 123s, and do you want to make their learning fun? 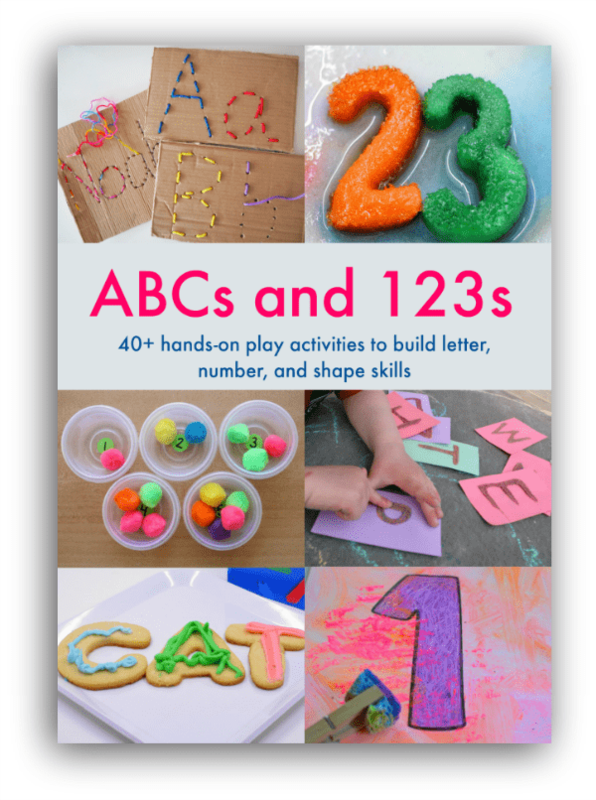 Our ABCs and 123s resource of multisensory, play-based letter and math activities is just what you need. See more here!